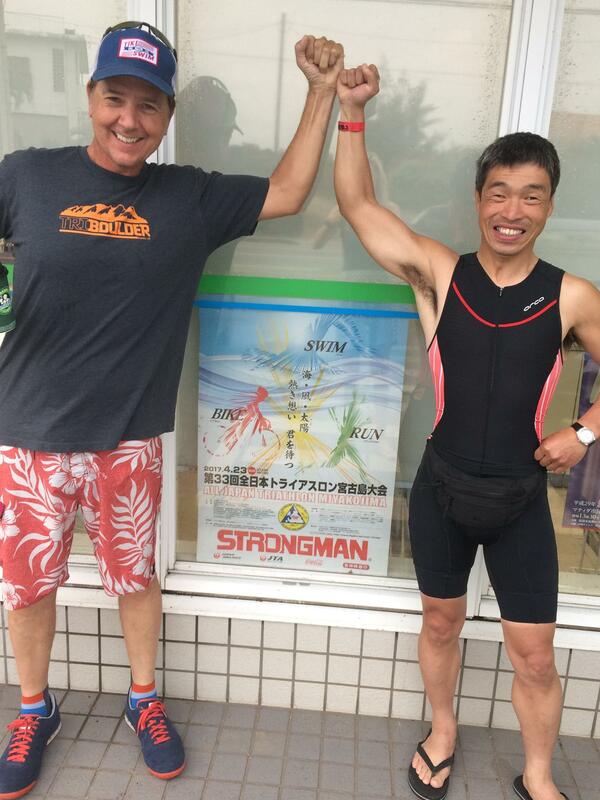 Guide Rich Anderson and Hiro Iwamoto ready to race Strongman Miyakojima. I had the pleasure recently of talking triathlon with TCSD member Hiro Iwamoto. Hiro has led an amazing life. His story is sure to inspire you when you face your next challenge. I am so glad I had the chance to get to know him and I know you will feel the same way once you hear his story. Craig: When did you lose your sight and what was the cause? Hiro: I was born in Kumamoto, Japan, and during elementary school, like many other boys I wanted to be a professional baseball player. So I would always play baseball with my friends after school. Then when I was 13 I realized I was losing my sight for the first time as I was playing baseball with my friends. I could not catch the ball because I could not see it. Everyone on my team started blaming me when we lost a game. But even in that kind of situation, I could not tell them that I couldn’t see. I did not want them to know that I was losing my sight. After a while, I started bumping into things as I was walking. My parents took me to every eye doctor they could think of, but none of the doctors could figure out the cause of my blindness. This meant that there was no treatment, no cure for my sight loss. Craig: How did you adjust to life without sight? Hiro: I was so scared, and I felt hopeless when I thought about my future. I wondered how my future was going to be. When I could not even put toothpaste on my toothbrush, I did not want to deal with my blindness anymore. I did not want to go on living asking for help all the time. On August 13th, 1982, it was a very hot day, the sun was shining, and a lot of cicadas were making sound, as I headed to a bridge in my hometown of Ushibuka to commit suicide, to terminate my life. When I got there, I took off my shoes and put both my hands and right foot on the rail, but could not pull myself up over the rail, I tried again and again, but could not go over the rail. It’s not that I didn’t have enough strength to jump, but it felt like some unknown force was preventing me from jumping. My uncle loved me so much as he would have adopted me if he didn’t have cancer. I gave up jumping off from the bridge and went back to my house. I returned to find that things were still the same, I still spilled toothpaste on my hand, spilled Miso soup on my lap, hit my head on the corner of my desk, etc. However, even in my daily struggles, I never thought about suicide again, because the message from my uncle was kept in a small part of my brain, and telling me that there is a meaning for all of this. Slowly but surely, I started to gain confidence and courage. Craig: What sports did you do after losing your sight? Hiro: After I became totally blind at 16, I wanted to find a sport in which I could compete equally with the sighted, so I began Judo. The first training I had to do was to lay on my back on the tatami mat and hit the mat with my arms. This was to train my reflex after being thrown by an opponent. I had to do this same training for a couple months and I started become bored and almost quit. But this experience taught me the importance of Kata, or form/discipline, in sports. And there was an incident where my Judo training helped my a great deal. In my early twenties, I was in San Francisco studying special education at San Francisco State. One day I was walking in downtown SF near Poway Station, and a pickpocket took my wallet and started running. Thanks to my Judo training, I was able to instinctively grab his shirt and do a Osotogari (threw him down on the ground), and handed him over to the police who happened to be near. For your own safety, you should not try to rob a blind guy. Craig: What prompted your move to the USA? Hiro: After returning from San Francisco State, I didn’t want to lose my English so I began attending an English class. My English teacher introduced me to her friend Karen, who would become my wife. She and I would go hiking along with classmates and the teacher from the English class and we grew closer as we got to know each other more. We eventually began dating and got married on May of 1996. Sorry, I am a traditional Japanese male so I don’t remember much of the details…I hope my wife is not reading this. After getting married, we lived in Chiba prefecture, and there was a yacht harbor close to our home called Inage yacht harbor. On our evening walk we found a rental yacht shop. Karen was already an experienced sailor as she had been competing in races from middle to high school. Although I had no prior sailing experience, we decided to rent a yacht and give it a shot together. This was how I started sailing. Craig: What happened during the challenge you began on June 16, 2013? Hiro: As a blind sailor, I began dreaming of sailing across the Pacific, the biggest ocean in the world, sailing from Japan to America with one other sighted person. I started sharing about my dream and passion everywhere I would go, and that helped lead me to the right people and eventually I was sponsored. Mr. Shinbo who is a newscaster for Yomiuri TV in Japan offered to be my sailing partner for my challenge, and Yomiuri TV company and other companies became our sponsors. I didn’t expect that my dream would come true so quickly. About three thousand people including many Tsunami survivors came to the port to cheer us on, and a Japanese Olympic female marathon runner, Kyu-chan (Naoko Takahashi), who won gold in the Sydney Olympics, came as a guest and we received her handmade bento lunch, etc. I was so happy. I had never felt as excited in my life as I was that moment when we left the port of Onahama in Fukushima. It was my idea to leave from Onahama port in Fukushima because I wanted to encourage the people there and be encouraged by them. We asked the people living there to write a letter to their family members and friends whose lives were lost in the Tsunami, and we planned to read the letters before putting them into the ocean. I was hoping that writing a letter would help them release their hardship, stress, and recover from their grief. On the sixth day around 7:20 in the morning, I heard something bumping on our boat three times, boom, boom, boom, Mr. Shinbo asked if those were waves hitting our boat, and I answered I don’t think so. When I heard the sound and felt the boat shake, I thought we had a collision with a whale. I took two gallons of water from the bottom and the emergency bag which contained a satellite phone, GPS and a VHF radio. Our team made a distress call to the Japanese Coast Guard. We then abandoned our boat and went overboard on our life raft amid 15 foot waves and 30 knot winds. At the time of the collision, we were already 700 miles out in the ocean and there was also a typhoon heading over our direction. Since the Coast Guard couldn’t get to us in time to rescue us from the storm and we were out of range of a helicopter, they dispatched the Japan Maritime Self-Defense Force (JMSDF). The JMSDF sent out a US-2 rescue aircraft (ShinMaywa US-2), but the first US-2 could not make a landing because of the high waves (the maximum height of waves it could land on is 10ft) and they were running out of fuel so after they circled over us trying to make a landing, they had to retreat. We felt hopeless and terrified when that first aircraft faded into the distance. Then 3 hours later, a second US-2 came. The pilot risked a dangerous landing to save us, and we were rescued after being stranded for 11 hours in the middle of the ocean. A press conference was held right after we were rescued and we arrived at Atsugi base, and a reporter asked me what I thought our boat bumped into. I believe I received a sixth sense in exchange for my sight loss and by then I knew it was a whale that hit our boat. Later we had experts confirm through the video left on one of our onboard cameras (we took out the SD card before we abandoned ship) that it was indeed a blue whale, approximately 50 foot big. Six days before this incident when we sailed out from Fukushima, I was at the highest point of my life, but within seconds I went straight down to a low point, in front of about 100 media people. I heard people say and was even told directly that it was a stupid plan for a totally blind person to try to sail across the Pacific. For a while I couldn’t see the purpose for this collision but before long I realized that this setback will make my future success 100 times even 1000 times bigger. Craig: After your near death experience, it makes sense that you would have a legitimate fear of water. What have you done to overcome that fear? Hiro: When I was searching for a way to overcome my fear of the ocean, DJ Rausa whom I met through the San Diego Business Group recommended triathlon. He offered to be my guide and not long after that we began training together. The most difficult part for me was swimming in the ocean. When I’m practicing at the pool I could feel along the lane rope and make sure that I’m going straight, and I could guess the distance from the wall by counting my strokes. But this is not possible in the ocean. So we use a rubber tube about 4 feet long and tie it around our waist. I have to figure out which direction my guide is going by the tension of the tube. I’m swimming to DJ’s right, so if the tension of the tube loosens, it means I’m leaning too far to the left, so I have to adjust my position to the right. If the tension tightens, I have to adjust to the left. When we’re on the bike or running, I can communicate easily with my guide, but in the water I cannot see, hear, or speak. When I was starting out, sometimes I panicked as I worried what will happen if the tube connecting us suddenly broke off. Every 2 or 3 strokes I would raise my head and check if DJ was still next to me, so we barely moved forward. This went on for a while but slowly I got used to it and in October 2014, I finished my first race at the Mission Bay Triathlon. I still clearly remember that excitement I felt when I reached the goal. Craig: You have raced 10 triathlons in your career which stretches from the 2014 Mission Bay Triathlon to the 2017 Oceanside 70.3 and Strongman Miyakojima in Japan. What triathlon accomplishments give you the most pride? Hiro: In April of 2016 I joined the Blind Stokers Club (BSC) which provided many training opportunities to work on my cycling. At one event I was able to ride for 50 miles for the first time. I thought to myself, “if I could ride 6 more miles, it would be the same distance as a Half Ironman”, and that boosted my confidence and lit a fire inside of me to keep challenging. From then I began training for the Chula Vista Challenge Half Iron Triathlon that was in August. I also competed in the San Diego International Triathlon (SDIT) and the Carlsbad Triathlon as I prepared for the Chula Vista Challenge. SDIT was the first time I did a floating start, so just keeping afloat was a struggle for me and I used up most of my energy before the race even began. It was also difficult for me to keep facing the same direction while floating, so I was anxious and kept on asking my guide if I was facing the right direction. A couple of minutes after the race began, the next wave of swimmers approached from behind us and they probably didn’t notice that I was blind and tethered to my guide, so they kicked my head and grabbed my shoulder as they tried to get past us, and at that point I felt like giving up, but somehow I was able to get back in focus and finish the race. The Carlsbad Triathlon was my first ocean swim experience. No matter how hard I swam, the waves kept pushing me back, and the fact that the waves were keeping me from moving forward exhausted me both physically and mentally. But my guides Rich Anderson and Patsie Dephney cheered me on and I was able to complete the swim. Less than a month away from the Chula Vista Challenge, I found out that Rich was competing in Ironman Boulder. The race was a week before the CVC and I was concerned about Rich’s physical condition, so I felt the need to find another guide. My other guide DJ had a back injury so he was not available and I wasn’t able to find anyone through BSC. I was worried that despite all the training I did, I would not be able to compete in the race. For us blind triathletes, no matter how much we are prepared and want to compete in a race, it is not possible without a guide. I was feeling a little down when I went to a friend’s house party where I happened to meet Greg Smeltzer. I told Greg my desire to compete in the CVC and begged him to be by guide. He kindly accepted, and although we only had time to train together twice, we were able to enter the race. I couldn’t believe that he had only two prior experiences as a guide as he was so calm and stable the whole time we were practicing. The weather was very hot on the day of the race and while running I began to get so nauseous that I almost threw up and couldn’t even swallow the nutrition gel, but with Greg’s help I was able to finish the race. Usually after I finish a race, I would immediately head over to the beer tent, but that day I didn’t have any energy left so I went home exhausted and sank into my bed. During the race, as I was running and feeling nauseous, I said to myself, “why did I even get into this agonizing sport” and was getting mad at myself. I even thought I would never do triathlon again. But a couple of days later, as I reflected on the joy of reaching the goal that day, I began to think that if I could complete a half, maybe I could take the next step and challenge a longer distance. Before long, I had registered to compete at the All Japan Triathlon Miyakojima (also known as Strongman Miyakojima, Swim 1.9mi, Bike 98mi, Run 26.2mi) in April 2017, which is the most popular race in Japan, and the upcoming Ironman Arizona in November 2017. Also as part of my training for the race in Miyakojima, I signed up for Ironman 70.3 Oceanside. For me, the heart crushing uphill ride that everyone was talking about was the most difficult part of the race. I had been practicing on the hills in Torrey Pines, but the hill on this course was much steeper. No matter how hard we pedaled, our speed would not go up but instead our legs were becoming sore and our speed kept slowing down. If we were to stop, it would have been impossible to pedal out again because of the steepness of the hill, so we would have to walk our bike to the top. There were actually some racers around us who were doing this. But we were able to keep pedaling and by the time we made it to the top my legs were shaking and I was worried if I could even run. As we began running, I could barely move my feet forward and didn’t think I could keep running for 13 miles, but after we passed 3 miles I began feeling lighter and we were able to make it to the goal. This was the first time I competed in an official Ironman event, so I was overwhelmed by the energy of all the participants and the big crowd that was cheering us on, and the excitement I felt when I finished the race was even greater than the previous races I’ve been in. Many people saw me during the race and afterwards told me that seeing me compete gave them inspiration and encouragement, that they were moved to see me. As I heard from these people I remembered the voice I heard when I was 16 and tried to kill myself, the voice that told me to keep living to give hope to others, and the people that day helped me realize that the message I lived by for all these years had come true and was being fulfilled. Along with my guides Rich and Patsie, I departed from LAX to Japan to get there a week before The Miyakojima Triathlon. I thought we would need to spend at least a week to get used to the humid climate and get rid of the jet lag. We arrived and saw that all over the island of Miyakojima, there were posters with the name of the race “STRONGMAN” (a title given to everyone who finishes the race) written on it, and you could tell that this event was special for the people of the Miyakojima and the whole island was involved in the event. I realized that I had made the right decision in getting there early when we began training on the first day we arrived, as the hot and humid weather sapped us of our energy much more quickly than the mild climate of San Diego. I became nervous as I wondered what the weather would be like on the day of the race. There was another thing that I was concerned about. The Miyakojima Triathlon is known for its tradition of beginning with a mass wave start instead of a regular wave start. This means that all 1500 participants begin swimming at once. Even with a regular wave start people would kick and climb over me from behind, so I was very worried that all these people would be swimming around me. On the day of the race, at the sound of a horn everyone began going into the water one by one. Rich and I started on the outer edge close to the front. The race began and just as I expected, I could barely move with all the people around me. People began climbing over the rubber tube that tethered me and my guide, some of them shoved me down and I swallowed some seawater, and we were almost pushed out of the swimming course. We would be disqualified if we swam off course, so we moved inward to the center, but there it was even more difficult to swim. Then suddenly something slammed my face real hard. It seemed to have been someone’s heel. My lip started bleeding. With the taste of blood in my mouth, I kept crawling slowly and tried my best to move forward. After we passed the 400 meter mark the course began to widen and I was finally able to swim freely. At that point another concern came to mind and that was to finish the swim before the 1 hour 50 minute time limit. We sped up as we tried to regain the time we lost. We came all the way from the States so I didn’t want us to disqualify at the swim stage. We were able to finish the swim 5 minutes before the time limit. Although the distance of the swimming and cycling stage is a little shorter than a full Ironman, the time limit for this 126 mile race is 13 hours and 30 minutes, which is 3 hours and 30 minutes less than a full Ironman. With the time limit in mind, we pedaled as fast as we could. The wind was strong and there were a lot of uphills and downhills, also we had to add air to our front tire near the 10km mark, but we were able to finish the cycling stage. Then we transitioned to the running stage, but the course was inland so there was no wind and the climate was so hot and humid. And about 20km in my guide started to get sick. Although he kept running for me about 10km more, we had to stop around 30km so unfortunately we did not quite finish. For me, triathlon is similar to sailing across the Pacific as they both represent life itself. Sometimes we can cruise along easily while other times we struggle to barely move forward, and after a period of pain comes a period of joy. I think that’s why I’ve been able to continue doing triathlon and not give up on my sailing challenge across the Pacific. And in case you were wondering, I’m training for Ironman Arizona in November of this year. Craig: What qualities make up a good guide for a blind triathlete? Hiro: I’ve heard that a guide should be at least 15-20% faster than you are. My times are 50 minutes for a 1.2 mile swim, 3.5 hours for a 56 mile bike, and 2.5 hours for a 13 mile run. I think a good guide needs to give an accurate description of the surroundings during the race. He or she also needs to run/swim/bike at the same pace. Someone that could help you reach your full potential. Currently my main guides are Rich Anderson and Greg Smeltzer. I would describe Rich as a completer and Greg as a competitor. Rich is focused on finishing the race. He taught me the importance of taking each stroke, pedal, or step one at a time until you reach the goal. Greg is focused on getting the best time possible. He has taught me to push my own limits to achieve the best results. Craig: I spoke with your guides Greg and Rich and asked them what their experience been like to serve as your guide? Greg: I would say my initial reluctance stemmed from not being strong or fast enough. After speaking again with Hiro we determined that I was 20% (I think this is the formula he uses to determine) faster than what he was pacing at so we would be fine. He was training for Chula Vista Challenge and had Rich as a guide, but Rich had done Ironman Boulder and was not going to be recovered enough to guide. Hiro asked me and we had just two weeks to prepare. We met for a swim and that went well, no problems tethered. We went on I think one or two bike rides and same for running. We completed the race with no issues although the many turns on that course and the sidewalk run did almost take us out a few times. When we finished though, the feeling was incomparable to any race I had done before. We went to a development camp for blind athletes a few months later and I think one of the most important things I took away was that we as guides are a tool for the athlete, like a pair of shoes or bike. Like many people have multiple pairs of shoes or different bikes for different runs and rides, a blind athlete will benefit greatly from being able to access multiple guides for different workouts. We are now training for Ironman Arizona and we try to meet 3-4 times in one week, alternating weeks. I have gained a whole new perspective on triathlon, and life by guiding and would recommend others trying as well. Rich: When I joined the San Diego blind stokers club I wanted to obviously be able to captain someone that needed help to enjoy a hobby/activity that they loved. In the back of my mind I was really hoping that I would be able to meet someone visually impaired that wanted to try a triathlon. After only a few months as a member I was introduced to Hiro. He was very excited about the idea of doing triathlons regularly and the training involved. I could have not asked for a better person to be paired with. Not only did he keep us on a regular training schedule, he was an engaging training partner. Hiro was always pushing us, talking all the time and after a while one starts to forget that he is blind. It was amazing to watch how someone with no vision was really so independent. I will always remember the races that we did and the cheers we got. I am a middle to back of the pack triathlete with little fanfare, but guiding Hiro thru races was so much fun to be next to him receiving such loud cheers and encouragement. The icing on the cake was the times I would get to guide him up onto the podium to get his medal for placing in the Challenged athlete division. Craig: How can people contact you if they would like to learn more about guiding you? Hiro: Right now I’m trying to connect with as many guides as possible. The reason for this is that having only one or two guides puts a lot of pressure/burden on the guide. Having more guides would lighten the burden for the individual guides. It’s also better to have more guides in case my current guide gets injured or are not able to race for some other reason. Also if possible, I’m looking not only for guides but also for rides, for people that could provide transportation. The best way to reach me is through email at blind.yachtman@gmail.com. Craig: What are some of the funny things that happen around a blind guy in a triathlon? Hiro: When people ask me how a blind guy like me can ride a bike, I would tell them that I ride in front of the tandem and steer while my guide tells me which direction to go. Most people actually believe me and don’t realize that it’s a joke. Sometimes when I tell my guide I don’t think I can go any further, he would tell me that there is a beautiful woman in front of us so we should just follow her. Then somehow I would regain my energy. Craig: What are your favorite benefits of being a TCSD member? Hiro: I am amazed at the great community that the TCSD has for its members. I’ve received so much motivation and encouragement from the people I met through TCSD. I wouldn’t have been able to reach the level I am at right now without all the training programs that the TCSD provides including track workouts, master swim, Del Mar open water swim, and the monthly Aquathlon. I think I would have been way behind if I were just training on my own. I greatly appreciate all the coaches and organizers of TCSD for helping me out and providing these resources. Craig: What do you do for a living? Hiro: I practice a therapy based on acupuncture and oriental medicine that I invented called Shishijutsu. My office is located in Kearny Mesa and I see all kinds of clients with conditions ranging from sports injuries to insomnia. In my work as a life coach, I give speeches and one on one coaching sessions based on my own experience of overcoming my disability. I travel several times a year to Japan to give speeches and seminars. I’m planning to expand my work as a life coach here in the States as well. Please feel free to contact me if you or your organization are interested. Hiro: I have been training for the Ironman Arizona 140.6 full triathlon this November. Also my dream is to compete in the Ironman World Championship in Kona. Craig: Hiro, thank you so much for telling us your story. Your fan club just got a lot bigger. The entire TCSD will be cheering for you to complete Ironman Arizona and to one day cross the finish line in Kona. It is people like you that make the TCSD the best club on the planet! This entry was posted in 2017, TCSD Conversation, Triathlon and tagged Arizona, Blind Stokers Club, Boulder, Chiba, Chula Vista, Coast Guard, Craig Zelent, DJ Rausa, Fukushima, Greg Smeltzer, Hiro Iwamoto, Ironman, Japan, Kata, Kearny Mesa, Kona, Kumamoto, Miyakojima, Oceanside, Onahama, Osotogari, Patsie Dephney, Rich Anderson, San Diego, San Francisco, SDIT, Shishijutsu, Strongman, TCSD Conversation, Ushibuka, Yomiuri. Bookmark the permalink. Great article! Do you know if Hiro is a follower of Christ? Hiro sounds like a real Overcomer. I would like to contact him and get him a Soul Trotters shirt. Please let me know if you’re able to give out Hiro’s contact info. I’m glad you enjoyed the interview. I will send you a separate email offline with Hiro’s contact information. I hope you and the family are well.